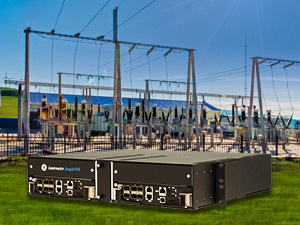 ORLANDO and PARIS – February 9, 2016 – Today at DistribuTECH 2016, GE (NYSE: GE) launched Lentronics™ JunglePAX, a packet switched networking solution specifically designed for utility operations. This solution will help enable the convergence of the many utility communications requirements and reduce cyber vulnerabilities. It will also provide Utility-grade Quality of Service to meet the strict operating requirements of teleprotection traffic. Today, smart technologies, ever more intelligent field devices and stricter security conditions are driving up Internet Protocol (IP) and Ethernet bandwidth requirements. Utilities need to enhance their communications infrastructure to meet these demands, while maintaining the operating performance characteristics required for traditional mission critical communications conditions. The Lentronics JunglePAX platform allows utilities to meet new packet switch requirements, while maximizing service availability. In addition, it also improves service quality, efficiency and ease of integration. Lentronics JunglePAX uses Multi-Protocol Label Switching with Transport Profile (MPLS-TP) technology¹. The platform performs pre-determined repeatable outcomes using packet based applications, providing utilities with consistent and reliable performance in spite of any fluctuations² in the network. It is also designed with layers of redundancy for improved security and dependability. This is a one box solution for mission critical and essential Operational and Informational technologies (OT/IT). Capable of connecting multiple and diverse applications, it allows utilities to deploy a simplified secure network design. "As utilities embrace new technologies, they have to maintain the performance of their existing assets. It is critical for them to ensure that this integration of new and old be as smooth as possible." said Adam Nicholls, Senior Product Manager at GE's Grid Solutions a division of GE Energy Connections. "The Lentronics JunglePAX is an integrated, application-driven solution. It simplifies the network management model, allowing utilities to meet their IT Communications needs on a platform that addresses their critical communication component's specific requirements." GE will be showcasing the Lentronics JunglePAX at DistribuTECH at booth 1900 along with other leading industrial communications, software, grid automation and smart grid solutions which modernize the grid. ¹ MPLS-TP (Multi-Protocol Label Switching with Transport Profile) is a new profile of MPLS that includes key extensions that enables utilization in transport networks, reducing complexity as well as deployment and operational costs for service providers.